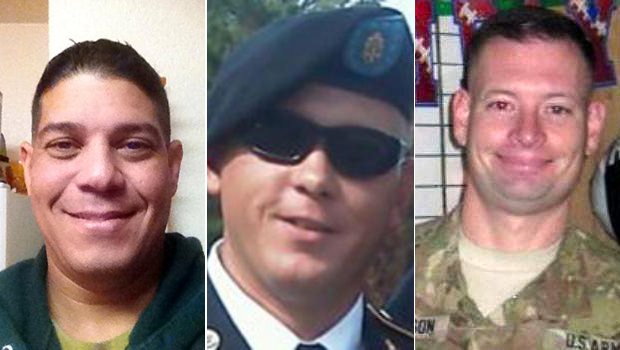 The three soldiers killed in a shooting rampage at Fort Hood by another military man had served in the military for years and been deployed to Iraq as well as other places. Timothy Owens was apparently shot in the chest at close range, his mother-in-law, Darlene Humphrey, told the Chicago Sun-Times. Owens' cousin, Glen Welton of Effingham, Ill., said Owens grew up with military dreams. "He was one of those kids who wanted to wear camouflage and wanted to wear bomber jackets and sunglasses," said Welton, himself a National Guard veteran of Iraq. "It took him a few years before he got himself in." Owens, 37, dropped out of high school in 1995, according to his mother and school records. She said he earned his GED diploma after joining the Army in 2004. Welton said he ran into Owens last year at a funeral and the two figured out they had served in Iraq at the same time. Welton was there from 2005-06. A photo from that day shows Welton with his arm around Owens, who wore his Army dress uniform, including a beret, and a pair of dark sunglasses. "He had grown into a man. The military had made him a complete man," Goodwin said. "I sure know he cleaned up pretty with his uniform." Owens' mother says she was reunited less than two weeks earlier with a daughter she gave up for adoption at birth. Mary Muntean of Effingham, Ill., said that she was still celebrating that reunion when she got a call telling her that her son was killed Wednesday in the attack at Fort Hood. Muntean told the AP she has heart problems and chronic obstructive pulmonary disease. Her 54-year-old daughter sought her out, and the two met on March 23, she said. "She finds one child and loses another," said Betty Goodwin, Muntean's niece and Owens' cousin. Owens was one of Muntean's four children. A younger son died eight years ago after a lifelong disability, Goodwin said. Family said Owens had been previously married and had children from that marriage. Danny Ferguson had just returned from Afghanistan, according to CBS affiliate WTSP in Tampa. The movement specialist was working at Fort Hood when Ivan Lopez opened fire. Danny's fiancée, Kristen Haley, who is also soldier, said she was nearby when the shooting happened. In an exclusive interview with WTSP Thursday night, she said Ferguson was killed while trying to barricade a door to keep the shooter away. "He held that door shut because it wouldn't lock. It seems the doors would be bullet proof, but apparently they're not," Haley said . "If he wasn't the one standing there holding those doors closed, that shooter would have been able to get through and shoot everyone else." Ferguson graduated from Mulberry High School in Polk County, Florida in 1993, according to WTSP. He was a prolific athlete, playing football, baseball, basketball and ran track. Mulberry High School teacher Joy Andrews said she wasn't surprised that he went on to fight for his country. "You usually don't sit around after graduation if you have that much in you," Andrews said. Ferguson's fiancee said he had an intense desire to serve his country. "I know that he did have a pleasure of serving. This was his life," Haley told WTSP. "He was proud to be part of a great service." Carlos Lazaney Rodriguez, 38, of Aguadilla, Puerto Rico, was among the three soldiers killed in the Fort Hood shooting, according to the mayor of Aguadilla. Mayor Carlos Mendez Martinez told NBC News that Lazaney was set to retire from the Army later this year. "They are an excellent family, really good people," Martinez told NBC News. "And what's so sad is that he was 38 years old and had joined the military since he was 18. He was going to retire at the end of the year. It is so sad."